I've always enjoyed languages. I like 'em dead, really, because then they can't go round changing on you. Latin, my favorite in college, is beautifully, thoroughly, conclusively dead. No one is inventing any new Latin idioms any time soon. No one has to worry about "google" switching from a noun to a verb in the Latin lexicon. I'm telling you all this because I'm about to tell you about my first rally, and even though you might think this will be a post about cars, it will actually be a post about languages. I guess I have to start with cars, though. Those of you who read the blog regularly will know that recently I bought a race car. How I arrived at purchasing a race car is a long, convoluted, and ultimately spoilery story that I cannot and will not share at the moment, but all you need to know is that I have been having a mid-life crisis since I hit age seven or eight. You never know, man. You never know when that scythe-guy is coming for you. BUY A RACE CAR NOW BEFORE IT'S TOO LATE. This is the part where everyone always asks "do you mean Nascar?" No, I do not mean Nascar, because Nascar involves roads, and I think driving a car on roads is cliché. Everybody drives their cars on roads. My race car is a hipster car. It drives on gravel paths, which were cool before anybody even thought of asphalt. I feel like I've already said the word "car" a lot of times for a blog post I promised wasn't about cars. I'm going to skip ahead. 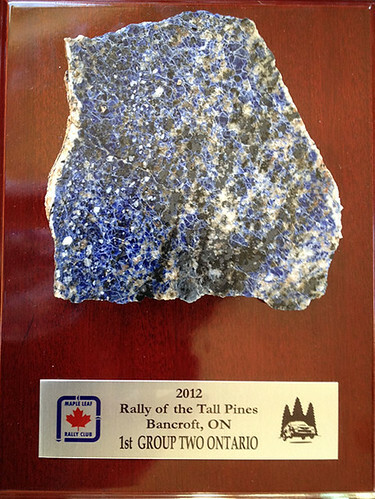 I'm going to skip to the part where we're all driving to our first rally, a Canadian race called Rally of the Tall Pines (which was not the species of tree I became the best acquainted with while there, but I get ahead of myself). We were in two cars — Lover and my dad in one, as I'm such a bad influence that they'd decided to race as well, and me in my Evo, listening to loud music that you will not like. After about ten hours of driving, we arrived at the Canadian border. I arrived first, and even though I turned down my music, Canada didn't seem happy to see me. ME: It's a reference to my next novel. It's sort of spoilery. I can't tell you. Ultimately, Canada let me in, although she looked displeased about it. It just goes to show you, though, that people believe in the packaging. If the cereal box says "heart healthy!" they totally think it's good for their cholesterol levels. 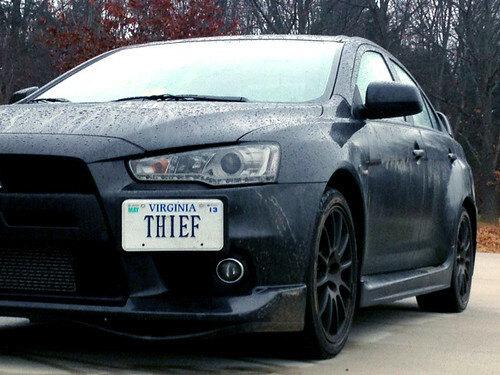 If the car says "THIEF," clearly the driver is a stone-cold bandit. So in I stole to Canada (get it? get it?) and didn't even speed that much. I don't think, anyway. Everything is in kilometers in Canada and I find it hard to speed in kilometers. Once again I find that this blog post seems to be about cars, and I promised languages. I'm going to skip ahead again. Including my car. It was still white and naked — it won't be sexily vinyled* up to look like the book cover until the 2013 races. But I liked it anyway. *I feel this is the most innocent use of the phrase "sexily vinyled" ever. THIS IS WHERE I'M FINALLY GOING TO TALK ABOUT DEAD LANGUAGES. 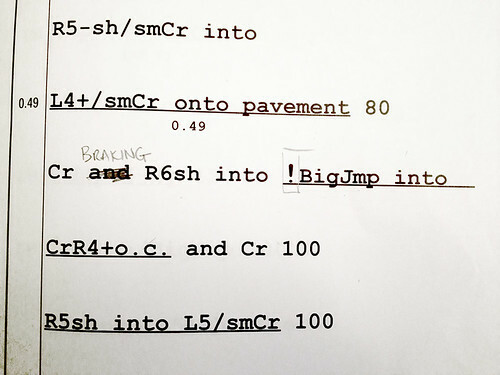 In an attempt to make fewer cars and humans die, rallying has adopted stage notes. Each rally's Big Book of Misadventure/ Handbook for the Recently Deceased lovingly describes each turn, crest, jump, and distance. Like a bedtime story on fast forward, the co-driver reads these to the driver at precisely the correct time. With funny voices for the good parts. And this keeps all parties from being shocked by a suddenly tight turn with a cliff on the other side. What a fine bedtime story that is! You can see, in addition to its compelling prose style, how it would prevent the car from flying over a blind crest and off a cliff. You can also see how a, when the co-driver and driver are working perfectly together, you can hurtle along blindly, much faster than a) someone without notes or b) someone with common sense. And did you notice that it is a lot like a DEAD LANGUAGE? A language without jokes, but still, a language. 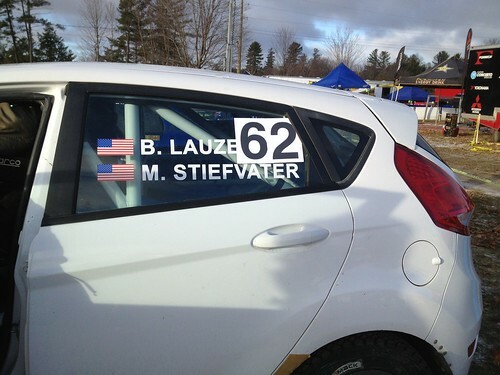 I'll admit that when I cooked up my plan to race with Bill, I fully intended to co-drive as little as humanly possible. All I really cared about was hurtling through the woods behind the wheel. But . . . color me fascinated. Driving + dead language = puzzle. It also helps that co-driving is really hard. As in, the hardest thing I think I've attempted in the last ten years, and that includes trying to make tortillas (I always somehow end up making the kitchen smell like fish). I'm sort of a practice junkie. I don't like not being good at something. 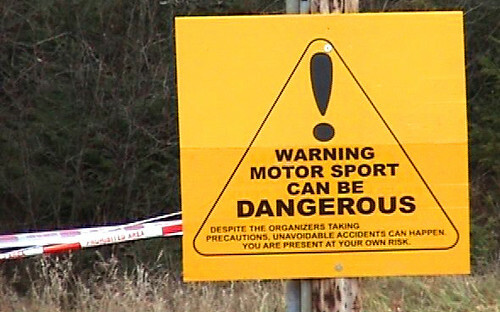 Basically what I'm telling you is that you're going to be hearing rumors of me doing a lot of co-driving in 2013. And hopefully improving. I think I'm done with the language part of this blog post. I think now I'm going to consummate my tree references by telling you that on the first stage of the rally, Bill and I hit a tree. A small one. Five inches diameter? Seven? It was not a pine, though. It was a birch, and it left a birch-shaped print on the hood of the car. Possibly the most interesting part of hitting the tree was lifting our eyes to where another rally car was buried in the trees a few yards ahead of us. Clearly someone had had the same idea as us, only they'd approached it with more enthusiasm. It was a cautionary tale. Really, this shouldn't have happened, as it was my first rally and Bill's first rally. And because we started off by hitting a tree. But we got better. You, gentle reader, might also be pleased to know that Lover and Dad did not roll over, crash, or otherwise destroy their car. I hear that they swore more than us, though. And I'm telling you now that Lover knows a lot of swear words. Some of the compound words he knows are linguistically incredible. I'd tell you, but there are children reading this blog, and they don't need to hear #$%^&nozzle in a sentence. Anyway, the rally was brilliant. 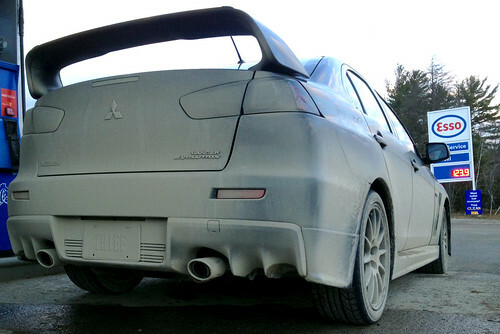 And I was looking forward to driving back over the border into the U.S. We used the Evo to recce the rally roads, and it looked delightfully disreputable, and I was certain that they'd be even more suspicious than Canada had been. U.S.: Tall Pines! AWESOME! How'd you do? 2013's going to be awesome.